This past Monday night PJ Harvey and John Parish introduced California to songs from their incredible new collection, A Man A Woman Walked By. It's the pair's second collaboration, a dozen years after the sparse yet fierce Dance Hall at Louse Point. With four musicians backing her, Harvey was in full diva mode, never touching a guitar but shaking maracas like Mick Jagger, twirling and freaking and dancing and yowling and whispering and, in general, delivering an absolutely riveting performance that at times suggested exorcism and denial -- the Prayers on Fire fury of "Pig Will Not" -- at others conjured a melancholy beauty that drove her waltz around while bemoaning our fair state -- "Leaving California," with a refrain that includes the line, "Get me out of here." There aren't enough mournful waltzes about California, for sure, and certainly not enough by PJ Harvey. In a sentiment most of us have uttered at one time or another, she confesses, "I don't know why I'd stay/I think it's time to leave." Critical superlatives at this point are meaningless when it comes to one of rock's great vocalists/songwriters/instrumentalists/charismatics, but it wouldn't feel right not telling you that A Woman a Man Walked By is Polly Jean Harvey and John Parish at the peak of their powers, a rich, velvet-upholstered 10-song creation (she wrote the lyrics, he the music) featuring humming church-organ ballads ("April") and defiant, emasculating indictments. The title track features the amazing lines: "He had chicken liver balls/he had chicken liver spleen/he had chicken liver heart/made of chicken liver parts/lily-livered little parts/lily-livered little parts." Performed live, the song was one of the peaks, a great rock and roll moment that recalled both Captain Beefheart and Moms Mabley -- a bawdy romp that made all the men at the El Rey laugh nervously. "Pig Will Not" sounded like former collaborator Nick Cave's first band, the Birthday Party: throughout the absolutely frightening song, Harvey stomped around the stage like Howlin' Wolf screaming, "I will not! I will not!" But the deft emotional pirhouettes she and the band are able to present at this point in their careers allow for them to offer gentler numbers, as well. The ukulele dream-ditty riddle about a soldier's sorrow, "The Soldier," saw John Parish strumming gently while Harvey sang to the crowd. 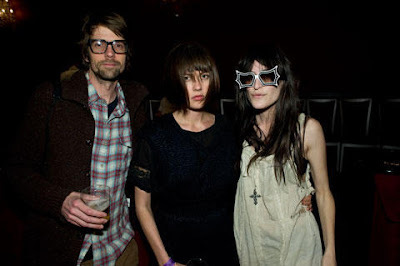 LA Weekly: How do you think the Austin show went? John Parish: It was good. It went very well. We were really pleased with it. 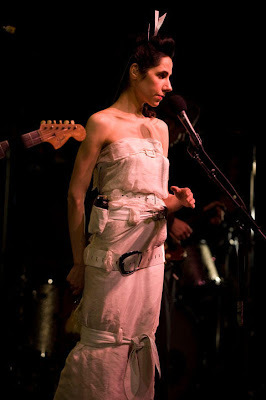 PJ Harvey: I really enjoyed the show. I thought that we played well. It was only our second show to date performing this material. JP: Oh no, there's definitely discussions on the visual aspects. Polly has a really clear idea of those things. In this particular collaboration I'm quite more of a musical director, so it's my responsibility to take care of how things are sounding, and how the band is working. And so Polly has more time and energy to work on presentation, and that seems to work well. PJH: I had a very clear idea of how I wanted the stage to look, and the band to look, and the lighting. And I'm very pleased with how it turned out - more than pleased. I think it looks just right for matching the music with delivery. That's obviously what one tries to do, is to create the right environment to play the music. Going back to what you said about the solo shows centered around White Chalk. Being that those were solo shows, and very intimate in its nature, I wanted to make it quite warm, with instruments sitting on stage, which not only helped me play, but to invite the audience to seem to share that space with me. When I'm working with a band, which we are now, the situation is different in its nature, and therefore can withstand quite a different approach. Do you dress them, too? I don't go as far as to dress them (laughs). But we talk about guidelines, and what I think would look good, and we go from there. And you design the tours with specific venues in mind, as well. You're playing the El Rey, which is much more intimate than the Orpheum. Is there specific intent there? PJH: Yes, we're very involved in what kind of venues we're playing, whether theatres or standing, what size they are. It always comes back to the music. It comes back to the show we're delivering - what we feel is the best space to be presenting that show. And always in the beginning of a tour, which is where we're at now - and particularly on a trip like now, which is much more about letting people know that the record exists, so we tend to play smaller venues than we might later on down the line. At this stage we don't know what call there will be for people actually wanting to come see us play anyway. Can you talk about how you collaborated together on this album, and what the differences are between your work when it's a PJ Harvey/John Parish album versus a PJ Harvey record? JP: Well, obviously I'm writing the music on this one. Both Dance Hall at Louse Point and the new record were made with me writing the music and recording the music, and giving copies to Polly and she would put the words on top, and then we get together and record the songs and the words that we're completely happy with. I think the main difference between the two collaborations is really how we've developed and progressed as writers and performers in the dozen years between the two records. So while we were basically following the same template, the end result, we both feel, is quite a considerable progression, on a much broader record. And it was nice, because it's quite difficult to judge your own progress as an artist because the records tend to be closer together so you don't have that distance. Dance Hall was a dozen years ago, so you can really see how you have moved on, and how we've been able to more fully realize the idea. I think the ideas on Louse Point were very good, but we weren't as capable of taking them as far as we're able to take them now. As career artists, do you feel like you have to constantly re-circuit the creative part of your brain to avoid repetition of ideas; it seems like it would be a danger to fall into the trap of accepting creative ideas that have worked for you in the past. JP: Neither of us are interested in repeating things that we've done, and I guess everybody finds their own way of trying to make sure that you're not repeating yourself. When we're working together, obviously we have each other to rely on to tell the other one if there is something that's in danger of being a rehash or a reworking of an idea that maybe we've already explored. I find myself, working with a lot of different artists as a producer. Howe Gelb's one of my favorites. PJH: Yeah, he's opening for us tonight. I know he is, and that makes me really happy. And you've worked with him, too, Polly, yeah? JP: Working with other artists, or working with film directors whenever I'm doing film music, I guess there's always an outside influence that's changing in the work I'm doing, and that definitely makes it easier to come in with new ideas, because there's always a new something in the mix. But we do rely on each other very much when we're writing, and when we're not working together we're in contact with each other and sending each other things to listen to. We pay a lot of attention to each others comments. It's been an incredibly helpful relationship for all these years, and we've had each other to trust. Does it get easier over the years to handle each others' criticism? PJH: Yes, and I think that's why I value our relationship so much in that working capacity. Because it's very rare, I think, to find somebody whose opinion you really respect, but also whose judgment will be truthful no matter what. And to be able to receive that, and give it in good heart is fantastic. It's very rare, and I think it's difficult for some people to receive criticism, even from a friend. It can be quite destroying. And I think that we have this very strong trust that enables us to handle even the harshest criticism of our work. And when you're working on something, it's your everything. It's very important to you, and it's very fragile in its early stages. To have criticism can be difficult, but not in this situation. Does it go so far as John saying, 'I'm not crazy about those lyrics'? - not that you would write lyrics he's not crazy about. PJH: (laughs) Sometimes there is capitulation. JP: Nobody is going to write everything fantastically. It's not going to happen. And it's really good to have someone to tell you that. And I think often it's the case when we know when something isn't quite right, and you need that other person to - I think that's why the relationship has been so successful, because we kind of know instinctively when we're not quite hitting the mark, when we need somebody, and generally each other, to confirm that. You have that niggling doubt, but you're not quite sure. Like, 'I thought there was something quite good about it,' and hanging on to that, and then the other person says, 'Nope.' And then you think, 'Okay, you're right. I knew it, I just hadn't ..."
Polly Jean Harvey with maracas: she didn't miss a beat. This being L.A., I feel compelled to ask you about the song, "Leaving California." Can you talk about that song, Polly? Well, I'm sure you know I chose to not discuss lyrics, because it seems very unnecessary to me. I think the beauty of a song is how the words completely coexist with the music to create the environment for the listener to make what they will out of it. So I don't chose to talk about that. I understand. John, can you talk about the music for that song? There need to be more waltzes about California, for sure. "Pig Will Not" I actually can't make it all the way through yet. And I like loud, aggressive music, but that song kinda freaks me out. PJH: I can talk a little bit about that song. What I always try to do vocally with what John presents to me musically is to match the environment that that piece of music is inhabiting, and strengthen it more. So I just absorb the feeling of the music that is given me. Obviously a piece of music like "Pig Will Not" and "A Man A Woman Walked By" are very difficult pieces of music, and it took me a long time to find a way in which I could convincingly deliver some sort of narrative that would not only match the music, but even enhance it more. What I do vocally always has to be absolutely together with the music in that they were made for each other and you cannot separate one from the other. So it took me quite a long time for me to find the way to present this piece. And I tried many different ways. I tried singing them. I tried intricate melodies. And none of that was working for me. And I felt what the song needed was to become quite a savage narrative in order to at all inhabit the world of the music. Polly, you tend to collaborate more with men than women, and I'm wondering to what extent that's intentional. PJH: The thought had never entered my head, actually. I just chose to collaborate with people whose music I respect and admire. And I haven't collaborated with that many people. I don't go out seeking collaborations, other than with John. Otherwise people come to me, and if that person I have an interest in their work, or feel like I can learn something from them, or respect their work, then I might chose to do it. Did you see any music while you were in Austin? PJH: I only saw one thing, and that was Echo and the Bunnymen, and I thought they were fantastic. It was so wonderful to see a band that's been going for that long, and still, I felt, actually inhabiting themselves and what they do with great respect and dignity. Yeah, and that's gotta be hard to do at some point when the expectations on you are to play certain specific songs - to actually expand those songs. PJH: I liked that they were playing new material, and they were also breaking down all their songs into a way that seemed to fit with what they were doing with the new material. Really, really wonderful show.